“Saying with a loud voice, Fear God, and give glory to him;for the hour of his judgment is come”(Revelation 14:7). Regarding that grain harvest, Jesus is commanded: “The time is come for thee to reap; for the harvest of the earth is ripe” (14:15). For the vintage it notes: “for her grapes are fully ripe” (14:18). This all occurs typologically when every person has made his eternal decision. Nothing can be changed. The crops are ready for harvest. It is associated with the time when the “Son of man” is on a white cloud (14:14) – His second coming – with a sharp sickle (the “harvesting tool”). This parallels another picture of when the sheep and goats are separated (Matthew 25:31-32) – everyone is ready to be divided into one of two camps. These are great symbols, revealing that when God draws to a close earth’s final scenes, judicial sentencing and separation (judgment) occur. A “great multitude in heaven” (Revelation 19:1) then cries for joy that God has finished this legal task: “for his judgments are true and just” (Revelation 19:3). Paul characterized the second advent as a time “when God’s righteous judgments will be revealed” (Romans 2:5). “I charge thee therefore before God, and the Lord Jesus Christ, who shall judge the quick and the dead at his appearing and his kingdom” (II Timothy 4:1-2). Before the sickle begins harvesting, the differences between the grain and the grapes – the sheep and the goats – must be made. A search for every bit of grain must be made – even in unlikely places such as the highways and byways. This task comes to an end during the fall Feast of Trumpets. This period of the Feast of Trumpets is when man’s final chance to repent and prepare for the wedding occurs. It is depicted as a sacred time when judicial decisions of the living move forward. “I was in the Spirit on the Lord's day, and heard behind me a great voice, as of a trumpet” (Revelation 1:10). “After this I looked, and, behold, a door was opened in heaven: and the first voice which I heard was as it were of a trumpet talking with me; which said, Come up hither, and I will show thee things which must be hereafter. And immediately I was in the spirit; and, behold, a throne was set in heaven, and one sat on the throne” (Revelation 4:1-2). The great themes of Revelation begin in the setting of judgment. This language is distinctly judicial, revealing that the “measuring” of God’s church, ministry and worshipers is underway! “And there was given me a reed like unto a rod: and the angel stood, saying, Rise, and measure the templeof God, and the altar, and them that worship therein” (Revelation 11:1). All this is a new phase of what began in Daniel 7:9-10. God’s witnesses then have a loud voice – it reaches a point where it is called a “strong voice” (Revelation 18:2).“Cry aloud, spare not, lift up thy voice like a trumpet, and show my people their transgression, and the house of Jacob their sins” (Isaiah 58:1). This all began when: “I will give power unto my two witnesses, and they shall prophesy a thousand two hundred and threescore days, clothed in sackcloth” (Revelation 11:3). All attachments to the world (religious and business) are to be severed. “Come out of her, my people, that ye be not partakers of her sins, and that ye receive not of her plagues (Revelation 18:4). “In one hour is she made desolate” (18:19b). This is a time of severance and total dependence. This is man’s last chance before the curtain of opportunity eternally closes. “(For he saith, I have heard thee in a time accepted, and in the day of salvation have I succoured thee: behold, now is the accepted time; behold, now is the day of salvation. )” (II Corinthians 6:2). When Trumpets ends, this is the court’s decree: “He that is unjust, let him be unjust still: and he which is filthy, let him be filthy still: and he that is righteous, let him be righteous still: and he that is holy, let him be holy still” (Revelation 22:11). "The harvest is past, the summer is ended, and we are not saved” (Jeremiah 8:20). There are many summary calls in Scripture. The Feast of Trumpets is the last. “Speak unto the children of Israel, saying, In the seventh month, in the first day of the month, shall ye have a sabbath, a memorial of blowing of trumpets, an holy convocation” (Leviticus 23:24). The first day of the seventh month of special holy convocations was Tishri 1. It was the beginning of a lunar cycle or lunar month. Tishri 1 was at a new moon. There was something special at this new moon. It was to be a Sabbath rest. It wasn’t necessarily on the seventh day. A new moon, a sabbath, a time of rest, when there is to be no work (Numbers 29:1). Final judicial case decisions lay just ahead at Atonement. There were “ten days” – an “adequate period,” a “complete set” of days to make a commitment. Centuries before, a ram “came to the rescue” of Isaac (see associated table – right). There were parallels between Isaac and Christ. Yet, it was the ram – the Lamb of God – that typified deliverance. “Through type and promise God ‘preached before the gospel unto Abraham.’ Galatians 3:8. And the patriarch's faith was fixed upon the Redeemer to come. Said Christ to the Jews. ‘Your father Abraham rejoiced that he should see My day; and he saw it, and was glad.’ John 8:56, R.V., margin. The ram offered in the place of Isaac represented the Son of God, who was to be sacrificed in our stead. When man was doomed to death by transgression of the law of God, the Father, looking upon His Son, said to the sinner, ‘Live: I have found a ransom.’"
According to professional musician and Shofar blowing instructor David Lloyd Perkins, the longer the Shofar, the easier it is to play and produce harmonics. “On a short ram’s horn I can get three harmonic tones,” says Perkins, “but on a long kudu Shofar I can produce between nine and 12 harmonics.” Later, it became known as a musical instrument. When it was blown, it was an urgent call to change course, escape, prepare. Here at the Feast of Trumpets, it becomes a final call to repentance. Many Bible scholars understand that this first of the fall feasts has eschatological significance. It would be the last chance to be a citizen of the Messianic Kingdom. Thus – the trumpet call, a “trumpet-like voice” on the Sabbath, is the setting of the whole book of Revelation; and its many “loud cries” of timing remain significant. 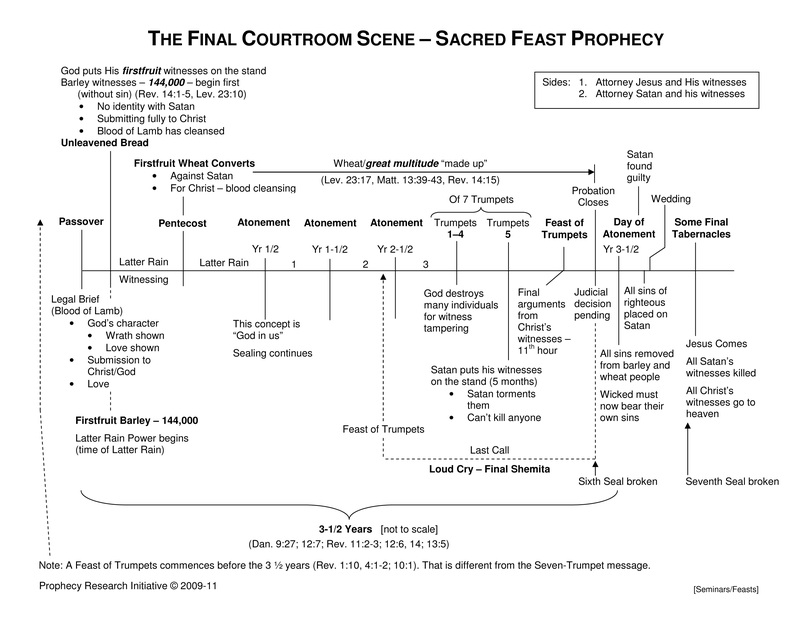 In an end-time setting, it is the “last call” to the marriage supper of the Lamb (Matthew 22:8-9). The Bible often says that “God repented.” This is simply a metaphor for His mercy. He will give man another chance. “God is not a man, that he should lie; neither the son of man, that he should repent: hath he said, and shall he not do it? or hath he spoken, and shall he not make it good?” (Numbers 23:19). Repentance is a task for sinful man. We have the history of pagan Ninevehrepenting and averting its doom (Jonah 3:10). Peter pled with his hearers, “Repent and be baptized” (Acts 2:38). John the Baptist cried for repentance (Matthew 3:2). Jesus did also (Matthew 4:17). Repentance is turning away from evil – sin. It is not a cosmetic gesture. It is a decision – a change – a genuine commitment. This change in mind/spirit/attitude/deeds is a command, the “final imperative,” which will be given during the Loud Cry. There are urgent parameters around this time. God can forgive us only in accordance with our spirit to forgive others (Matthew 6:12). “The Lord is not slack concerning his promise, as some men count slackness; but is longsuffering to us-ward, not willing that any should perish, but that all should come to repentance. But the day of the Lord will come as a thief in the night; in the which the heavens shall pass away with a great noise, and the elements shall melt with fervent heat, the earth also and the works that are therein shall be burned up” (II Peter 3:9-10). Chance for total submission is time limited. A time follows when the unrepentant will perish. Peter’s message implies an important timing issue that ties to the Trumpets! The “Day of the Lord” follows a final period of repentance. This is exactly what Zephaniah taught! “Gather together, gather together, O shameful nation, before the appointed time arrives and that day sweeps on like chaff, before the fierce anger of the Lord comes upon you, before the day of the Lord’s wrath comes upon you. Seek the Lord, all you humble of the land, you who do what he commands. Seek righteousness, seek humility; perhaps you will be sheltered on the day of the Lord’s anger” (Zephaniah 2:1-3 – NIV). The Day of Atonement comes after the defined period of blowing of the Shofar. Tishri 1-9 was the time allotted. "The great day of the LORD is near – near and coming quickly. Listen! The cry on the day of the LORD will be bitter, the shouting of the warrior there. “That day will be a day of wrath, a day of distress and anguish, a day of trouble and ruin, a day of darkness and gloom, a day of clouds and blackness, a day of trumpet and battle cry against the fortified cities and against the corner towers. I will bring distress on the people and they will walk like blind men, because they have sinned against the LORD. Their blood will be poured out like dust and their entrails like filth. Neither their silver nor their gold will be able to save them on the day of the LORD's wrath. In the fire of his jealousy the whole world will be consumed, for he will make a sudden end of all who live in the earth” (Zephaniah 1:14-18 – NIV). That brings us to a pivotal Trumpet issue. It will also be our last chance to warn the world. The final evangelizing is called the Loud Cry by some. In Israel, each new moon was announced by short blasts of a trumpet (shofar). It became symbolic of God’s last call. “Cry aloud, spare not, lift up thy voice like a trumpet,and show my people their transgression, and the house of Jacob their sins” (Isaiah 58:1). “Shall a trumpet be blown in the city,and the people not be afraid? shall there be evil in a city, and the LORD hath not done it? Surely the Lord GOD will do nothing, but he revealeth his secret unto his servants the prophets. The lion hath roared, who will not fear? the Lord GOD hath spoken, who can but prophesy?” (Amos 3:6-8). In fact, God will be giving many warnings at this time. We are “witnesses” to explain to the world what they all mean! “The word of the Lord came to me: ‘Son of man, speak to your countrymen and say to them: “When I bring the sword against a land, and the people of the land choose one of their men and make him their watchman, and he sees the sword coming against the land and blows the trumpet to warn the people, then if anyone hears the trumpet but does not take warning and the sword comes and takes his life, his blood will be on his own head. Since he heard the sound of the trumpet but did not take warning, his blood will be on his own head. If he had taken warning, he would have saved himself. But if the watchman sees the sword coming and does not blow the trumpet to warn the people and the sword comes and takes the life of one of them, that man will be taken away because of his sin, but I will hold the watchman accountable for his blood.” ‘Son of man, I have made you a watchman for the house of Israel; so hear the word I speak and give them warning from me’” (Ezekiel 33:1-7 – NIV). We are very soon to be asked to be His watchmen. Do you know what you will say? In the fall of a year that will come very soon, Satan will have only a brief time left to operate his deceptive schemes. Will you be one of the saints “ready to take whatever comes”? That final “little window” will see him in a frenzy never before witnessed. The last day of the Feast of Trumpets will draw probation to a close. When does this Tumpet Feast occur? In the fall, at a Tishri 1, just before the last three and a half years begin is the first of four final annual Feasts of Trumpets! The fourth will be at the end of the Loud Cry (Revelation 11:1-3). That is why when the first angel’s message sounds during that period, we will be able to say, “the hour of His judgment has come.” At that time – it will be the judgment of the living. We will know that precisely – because of these distinct clocks He has given to us. There should be no guesswork about what now lies just ahead. Study, study, study! Know these things! White, Ellen G.; A Sketch of the Christian Experience and Views of Ellen G. White, p. 44. White, Ellen G.; Gospel Workers, p. 27 (emphasis added). White, Ellen G.; Manuscript Releases, vol. 15, MR 1182,p. 321 (emphasis added). White, Ellen G.; Testimonies, vol. 2, p. 225. White, Ellen G.; The Seventh-day Adventist Bible Commentary, vol. 7, p. 971 (emphasis added). White, Ellen G.; Selected Messages, bk 1, p. 189 (emphasis added). White, Ellen G.; Bible Echo, February 1, 1897 (emphasis added). White, Ellen G.; Historical Sketches of the Foreign Missions of the Seventh-day Adventists, p. 234 (emphasis added). White, Ellen G.; Manuscript Releases, vol. 21, p. 437 (emphasis added). White, Ellen G.; Testimonies, vol. 1, p. 260 (emphasis added). White, Ellen G.; The Watchman, February 19, 1907 (emphasis added). White, Ellen G.; The Faith I Live By, p. 215 (emphasis added). White, Ellen G.; Last Day Events, p. 235 (emphasis added). White, Ellen G.; Patriarchs and Prophets, p. 102 (emphasis added). White, Ellen G.; The Signs of the Times, January 3, 1878 (emphasis added).